Rate of Change is the speed at which a variable changes over a specific period of time. and is used to create a momentum oscillator built on the formula: ROC = 100*(C /Cx ) where C is the latest close and Cx is the close x periods past. Ten periods is the accepted standard but it is adjustable in our software. The result is the percentage that the security's price has changed in the last x-periods. A rating of 110 means that the security is trading at 110% of its level x-periods past. The concept is to measure acceleration of price change. 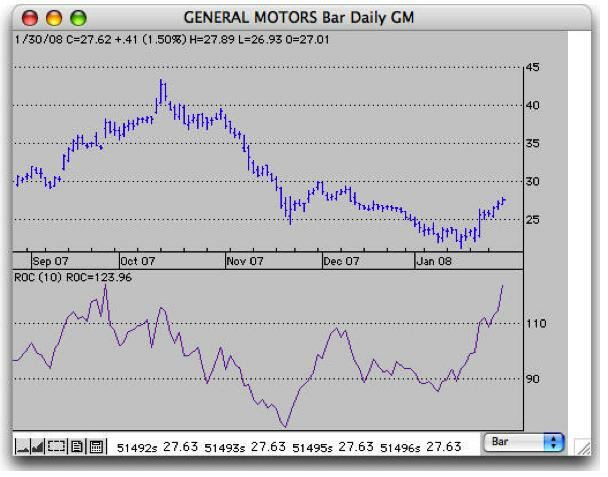 Analysis is similar to all momentum studies, look for trend, divergence and changes in direction. Rate of change may be viewed in your choice of a histogram or in line form (shown below) and may be overlaid with a user-defined moving average.